This is a solid, meticulously researched book on a notorious 19th century British female killer. Christina Edmunds was a poisoner who laced chocolates with strychnine. She was tried for the murder of a little boy and she poisoned many others. Her murderous impulses were sparked by unrequited love she had for a married man. Christina was found to be criminally insane and lived for the rest of her life at Broadmoor Hopsital (home of serial killers Peter Sutcliffe and Moors Murderer Ian Brady) , dying in 1907. The author Kaye Jones knew the case was a sensation of its time, garnering national press coverage. However the book is also a social history of life in Brighton in the late 1800s and a detailed account of Christina Edmunds’ family history. The epilogue is also fascinating as it applies a diagnosis to what Edmunds was suffering, which was not a recognised condition at the time of her crimes. Kaye Jones gave an interview to her local newspaper Andover Advertiser, which is a good background read if, like me, you are fascinated by the research and writing processes of authors. 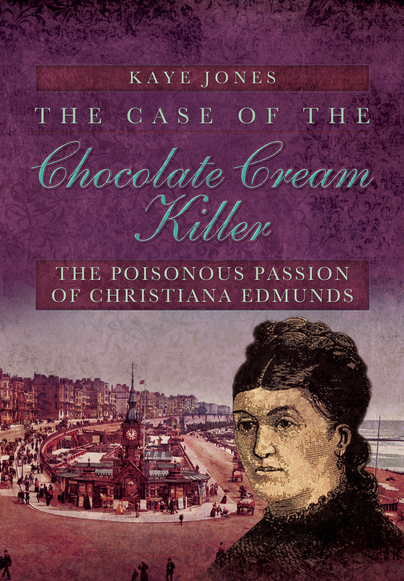 The Case of the Chocolate Cream Killer is published by Pen & Sword Books.